It would appear my love affair with Untappd is over. Gone are the days of furiously checking in every new beer that passed my lips. Passed are the times when I would intentionally go out searching for strange and exotic new beers, with the hopes of getting some obscure badge and internet props. So what happened? My third ever post praised the app up and down and my sights were set on tagging up some big numbers and new badges. Maybe it was the addition of different levels of badge that tainted the experience and robbed me of the thrill of attaining a new one. It could have been the time it took scrolling through the feed to “Cheers” fellow beer enthusiasts. No… no. It wasn’t that. My apathy towards this application stems from something much deeper. Good beer is still a big part of my nights out, but it’s no longer the central plot. Now it’s simply a common thread. The socialization of an evening has taken center stage. I prefer now to keep my hand away from the smartphone and engage in the conversations going on around me and honestly, I’m having a hell of a lot more fun. Another aspect is the financial drain that comes along with the need to incessantly try new and exotic brews. Common maths says that a 6 pack of Mountain Goat Summer Ale at $20.99 is cheaper per unit than $4.09 per can (pricing taken from Dan Murphy’s). Being a poor uni student who’s saving for a trip to Canada next year leaves me with very little extra for frivolous purchases of some new Stone beer that’s just hit our shores and costs $20 a bottle. Without Untappd, I now have the freedom to be a bit more frugal, and enjoy more local craft without that FOMO*. Glen from Beer is Your Friend wrote about hanging up Untappd back in July and it really got me thinking. Could I do it? Should I do it? Realizing that my total of 917 hasn’t ticked up in months from a lack of caring to do so, the decision seemed pretty simple. Being slightly obsessive compulsive, however, has stopped me from hitting the “Uninstall” button. There seems something magical about the number 1000. I can’t bring myself to kick the app to the curb without first reaching that milestone. I’ve decided that I’ll slog through the check ins a little bit longer until I hit my millennium beer after which I will happily uninstall Untappd and breathe a little easier. If you’re going to go out, go out with a bang. *FOMO – Hip, young lingo meaning “Fear of missing out”. Kinda like “YOLO”. Man, I hate YOLO…. I did the change in two stages. 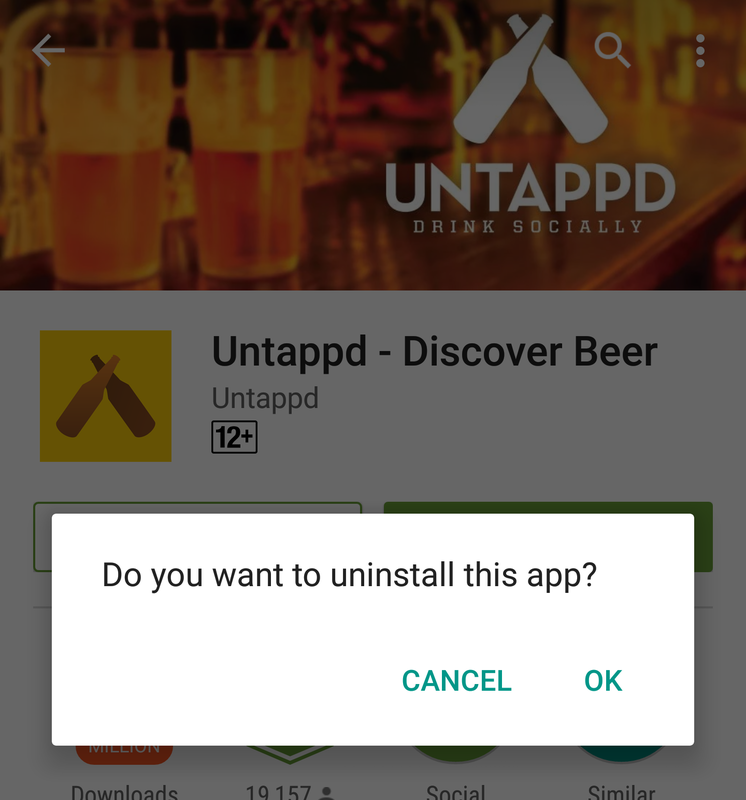 The first involved removing the Untappd app from the home screen on my mobile phone. The phone was how I checked things in. The app was still installed on my phone but, by not having it on the home screen, i found myself less interested in checking anything in. The second stage came a month or so later when I realised I hadn’t missed Untappd and all and so deleted my account altogether. Sounds like I’ve unintentionally followed the same pattern. Mine was already a few screens off the main one, so it looks like I’m in the final stage: acceptance. I have a slightly alternative view to this. Whilst I 100% agree that the financial pressure of having to try new beers to “level up” can get overwhelming, I can’t agree that it makes you less social. If it wasn’t for untappd, I would never have connected with other beer geeks. I’ve got a wife & a newborn daughter so my social life is non existent. Untappd & the “cheers” mechanism has allowed me to indulge my inner beer geek and to feel positive reinforcement from others who are also on the beer enlightenment journey. As someone who has enjoyed many cheers from yourself and yet only met you once or twice in real life I have to say that I’m going to miss your untappd activity (Glen’s as well). Maybe it will encourage me to get out more! This is true. I will miss the social aspect of the app. Over the years, I’ve been privileged enough to meet a few folks that have befriended me through Untappd. As it stands at the moment, I have uni, the blog, work x2, the Instagram account, and notifying the wife that I’m still alive, it’s hard to peel myself away to have any sort of coversation with people, so as the app goes, it’s getting the boot to take away that temptation. I will, however, still be checking in now and then and seeing what others are enjoying and throw a toast or two around from the browser version. If you do see me around though, be sure to come over and lets have a few real toasts!